And in case you missed it, we launched a new monthly Garden Party over the weekend. It should be lots of fun and full of inspiration. If your project is related to the outdoors, we want to see it at the Garden Party. And it's perfectly okay to link the same project to both parties. Hope you'll come join us! Don't you love the idea of mounting special photos on canvas? Check out Tuula's tips over at The Thrifty Rebel! 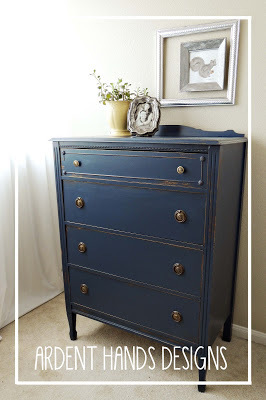 I am totally crushing on navy blue right now! It's definitely a color I'll be using in the next few weeks. 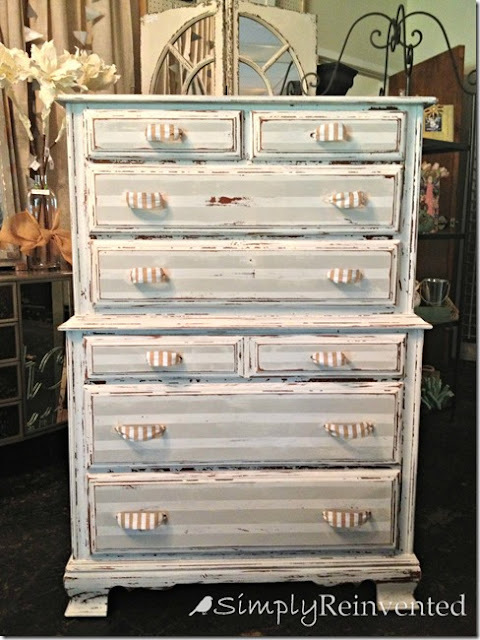 Love this dresser from Jennifer at Ardent Hands Designs! And more navy came our way from Reeves at The Weathered Door! How cool to have a pair of these nightstands. And don't miss the gold tips! This marvelous marigold antique vanity makeover comes to us from Stacey at Embracing Change! 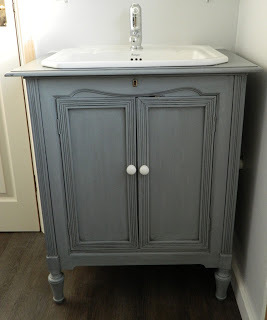 And there's just something dreamy about this sweet little cabinet makeover done in a French Country style from Fiona at Lilyfield Life! 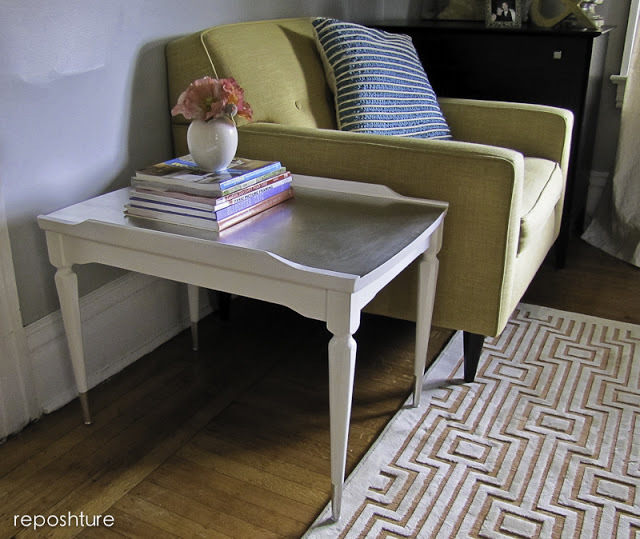 Kim from Reposhture Studio used silver leaf to makeover two end tables in the Hollywood Regency style - simply elegant! And I really want that chair! I'll take the rug too! Then check out the soft stripes on this chippy chest from Cindy at Simply Reinvented, complete with burlap striped pulls! 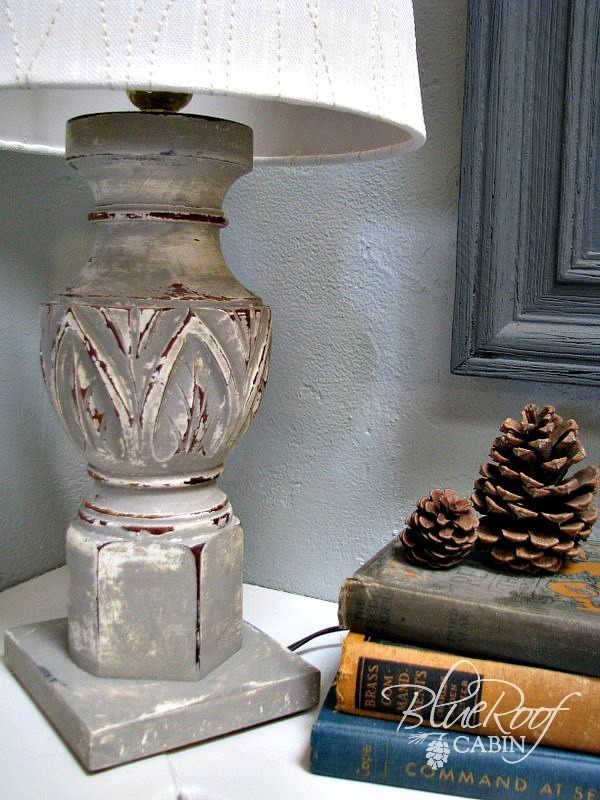 Mimi from Blue Roof Cabin turned the broken pieces of a table into this gorgeous lamp! Let's say it together - wow! 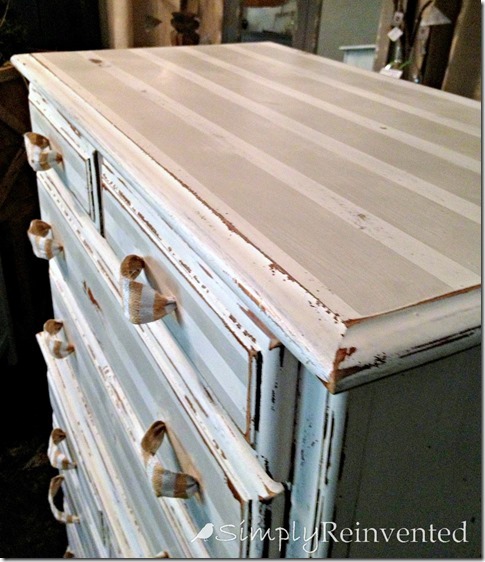 CJ from Juniper & Roses turned a worn cabinet into a stunning new bathroom vanity! I had already pinned these darling little berry boxes before I even saw them here at the party. 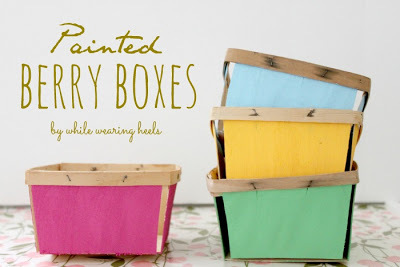 Such a sweet simple project from Amy at While Wearing Heels! And I have a love of all things lemon! This Braided Sweet Lemon Loaf with Tangy Lemon Drizzle from Aimee of Twigg Studios is totally calling my name! 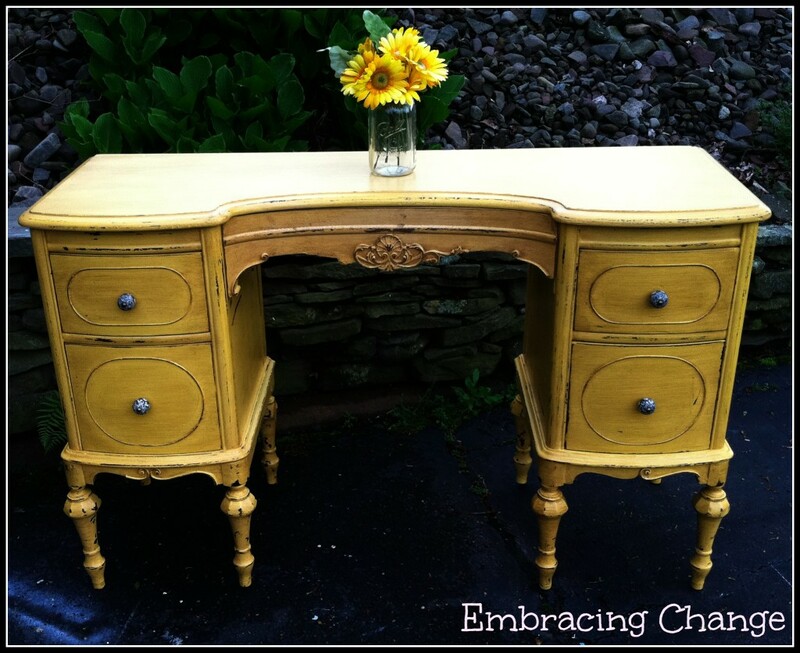 i love stacey's yellow piece, and you know that navy dresser makes my heart sing! Thank you so much for hosting Sharon...super features. Wishing you a wonderful week! I really love those grey pieces. I have something similar to Fiona's, have been stuck on what to do with it, now I know! Thanks so much for featuring my photos on canvas Sharon. I'm just thrilled to be included with such great features! Super cool features! I've always wanted to turn a dresser into a sink vanity! Thank you for hosting! This is my first time visiting! I love it! I am green with envy on your Lucketts trip...Looks fantastic! I cannot wait to come back! Thanks again. Beautiful features! Thanks for hosting every week, Sharon! I'm looking forward to your garden party too. Hi Sharon, I'm excited to see what everyone's been up to. Thanks for providing the party so we can share our ideas! Love that vanity!! The color is gorgeous. Thank you for hosting, Sharon!! so excited to be posting!! can't wait to check out what everyone else is posting!! 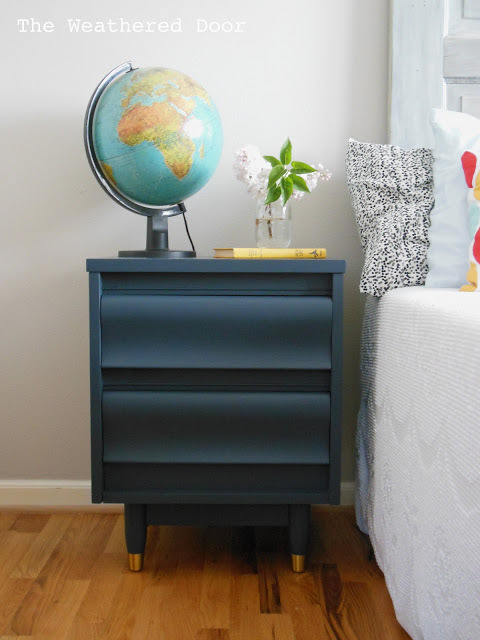 Thanks so much for featuring mY glamorous end tables Sharon! It is always nice to be recognized by one so thoughtful. Great furniture ideas for a few more pieces! Better get to work! !